I really enjoy using books as a learning tool in my home. For dealing with topics like feelings and emotions books can be a great tool for kids to listen and see in pictures what I am trying to explain. Now that my son is 20 months old I can tell he is having more emotions. Its sweet to see the happy ones and sad to see when he is upset. I do my best to explain to him on his level that I hear him, understand him and lets fix what is bothering you. Recently we had the chance to review some of the new books from Free Spirit Books from the Our Emotions and Behavior series. Playing fairly doesn’t always come naturally to kids—and sharing isn’t always easy. Plus, the hurt feelings that happen when others won’t share can make matters even worse. Nora, Henry, and Dan find this out when Miss Clover builds a special space station in their classroom. Everyone wants to play at once! Can they figure out how to share? Not Fair, Won’t Share shows that when kids get frustrated and mad, there are ways for them to calm down. 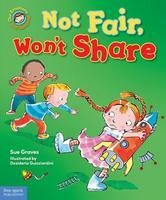 This book "Not Fair, Won't Share" arrived just in time for me to read with my son a few times before we had a day filled with having to share. He had 3 of his second cousins come over and he had to share all his toys, books, markers and cups. He was great with some items while others he was mad to have other kids touching his stuff. All perfectly normal behaviors and he did good. I did tell him he was being so nice to share his toys and thank yous when he would offer his stuff to play with. When it came to his crayons and markers oh boy was he mad. He likes to hold every crayon or marker he has all at once in one hand while he colors with the other. This time he did not want to color at all just hold them all so no one else could use them. I explained to him in the best way a 1 year old could understand that we can share our markers so we can all make pretty pictures. He let go of a few markers and crayons so the other kids could draw but he still refused to join in the coloring. I read him the book again today about sharing and reminded him how nice it was that he shared his crayons and markers. I know hes only 1 and might not totally get what I mean but I think its good for him to hear it. Kids and rules don’t always make a perfect match right away. But Why Can’t I? 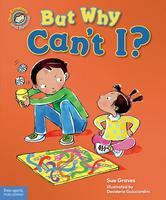 explores these feelings using simple text, cheerful illustrations, and a light touch of humor. When Jenny comes over to babysit, Noah doesn’t want to do what she says. Rules for games, rules for bedtime—rules, rules, rules! But Jenny helps him understand that adults have to follow rules as well as kids, and rules help keep everybody safe, healthy, and happy. I liked this one a lot. It shows the day of a brother and sister that are being baby sat and how they must follow the rules their parents set before they left. Thankfully the baby sitter sticks to the rules ( I know Sam and I had some wild baby sitters that once threw pennies at a pizza guy who was late) This book about following the rules is to show kids that there are rules for safety reason. I know sometimes parents can say "because I said so" and that usually does not make a kid really understand. This is good one too. Big feelings are part of daily life for small kids, and happiness just isn’t always within reach. Unwelcome events, from a broken toy to a missing pet, bring on sad feelings that can darken kids’ days. In this charming feelings book, follow along as Ben helps cheer up his friends and shows how kids can turn sadness into smiles. 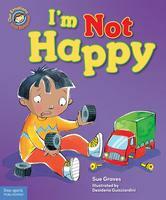 I’m Not Happy uses simple, easy-to-read text to present positive coping skills for children to use when they feel sad. I like this one for the way it shows kids its ok to be upset and when we are we need to look for ways to turn things around. I have the habit of always trying to be as cheerful as possible but that can be not always a good thing. Even as adults we need to remember to address the things that don't make us happy so we can fix them and not just cover them up. A great lesson for kids to see and learn. From pets to grown-ups, everybody sometimes feels fear. And children, grown-ups, and animals aren’t all afraid of the same things. Jack and his friends Ravi and Kevin discover this when they have a sleepover—one that unexpectedly includes a few scares! Who Feels Scared? 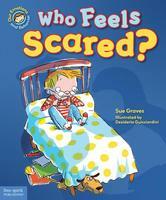 is a cheerful and reassuring story that shows that positive coping skills can help kids deal with fear, and children can be brave even when things seem scary. We have not yet dealt with this emotion yet since my son is younger than the recommended ages for this book series but I know this will come in handy when he does. I like that the book uses positive coping skills for kids to overcome emotions. After all we are emotional creatures who need to learn its how we react to things in life that makes things easier or harder. I enjoy the books from Free Spirit Publishing. They are teaching tools that have a little story in them. We still have the ones we review for my sons 1st birthday about washing our hands. My son likes to wash his hands when we come home from being out all day. He sees me doing it and I know it helps us from getting sick. Win a set of 4 books from Free Spirit Publishing from the Our Emotions and Behavior series. What other book from Free Spirit Publishing would you like to have? *Limited to US residents; 18 years old and above. Giveaway starts August 29, 2011 and ends on September 10, 2011 at midnight PST. Winner will be emailed and has 48 hours to respond before another winner is selected. I was not paid for this giveaway or post. I was provide the item in this review for free by the company or PR firm representing them. The opinions on this item are 100% mine and may vary from others. "Germs are not for sharing" looks neat. Accept and Value Each Person looks good too! I Like Free Spirit Publishing on Facebook - emillie rose. I Follow Free Spirit Publishing on Twitter - hisprincess886. I Like your new fan page on Facebook - emillie rose. I Shared this giveaway on Twitter - http://twitter.com/#!/HisPrincess886/status/110433857530118144. I shared on Facebook - https://www.facebook.com/permalink.php?story_fbid=252875694752187&id=100001891505536.